On September 15, 1948, Lieutenant Commander Willard T. Gove, 29, was piloting an FG-1D Corsair, (Bu. No. 88072), over the Atlantic Ocean 12 miles to the east of Cape Cod when the plane developed engine trouble. 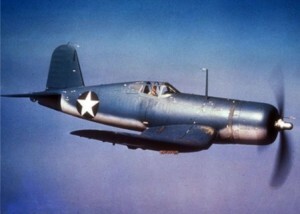 (The FG-1D was similar to the F4U Corsair.) He attempted to make it back to Cape Cod, but was forced to make a water landing about five miles from the coast. The plane hit the water at an estimated speed of 85-90 knots, causing back and head injuries. Lt. Cmdr. Willard was able to get out of the plane before it sank, but due to his injuries was unable to remove the life raft from the cockpit. He inflated his life vest and floated in the 50 degree water for about one hour before being rescued by a Coast Guard rescue plane. The life vest was credited with saving the pilot’s life, as the rescue plane had dropped a life raft, but the pilot was unable to climb inside due to his injuries.